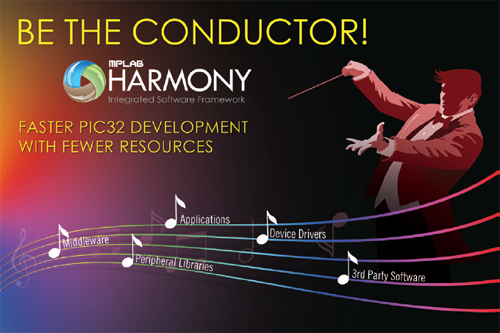 The MPLAB® Harmony Integrated Software Framework is a flexible, abstracted, fully integrated firmware development platform for PIC®32 microcontrollers. It takes key elements of modular and object-oriented design, adds in the flexibility to use a Real-Time Operating System (RTOS) or work without one, and provides a framework of software modules that are easy to use, configurable for your specific needs, and work together in complete harmony. MPLAB® Harmony Bootloader Warning Message - "...addresses that do not exist"
MPLAB® Harmony - Why are 21 bits reserved after 11 CAN ID bits? How much graphics frame buffer memory is required to display one full screen? How can I change my website homepage using MPLAB® Harmony? How can I add Telnet functionality to MPLAB® Harmony TCP/IP framework? Unable to create MPLAB® Harmony project or MPLAB Harmony Configurator (MHC) plugin crashes on load. Why can't I choose a specific BSP in MPLAB® Harmony Configurator ? Are there any GPL/LGPL licensed components in MPLAB® Harmony? What is the best way to search for answers in the Harmony Help file? Does the ADC on the PIC32MZ EC work well? Should I use it? Why does my MPLAB Harmony project have four logical folders named "framework"? Do I need to use version control when using MPLAB Harmony? Where can I find Harmony’s Software License Agreement? Is there a guide that can help me transition from MLA to Harmony? Which PIC32 product families are supported by Harmony? Who provides the support for third-party MPLAB® Harmony software? Where can I purchase third-party software for MPLAB® Harmony? Can I download individual MPLAB® Harmony software modules? Are there any fees associated with MPLAB® Harmony? Should I use MPLAB® Harmony libraries or the MLA? How does MPLAB® Harmony differ from Microchip's Libraries of Applications (MLA)?